Jan Siberechts was a landscape painter, a genre on which he focused from a young age and his earliest known works are of this type. Siberechts was born in Antwerp into a family of artists, first training with his father who was a sculptor. 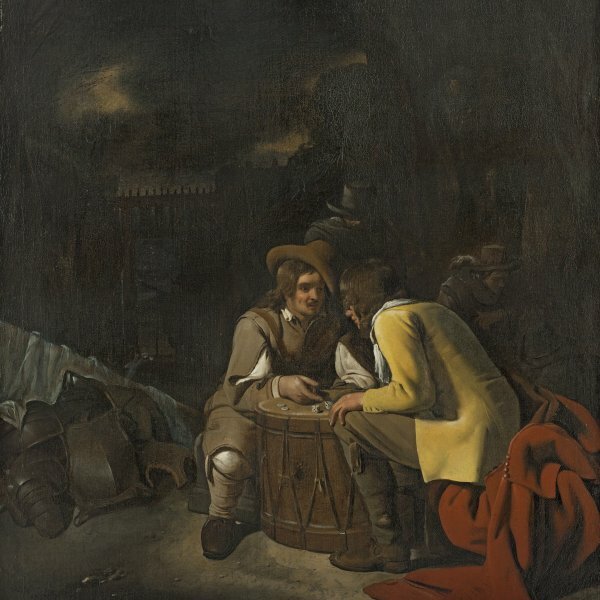 Siberechts’ first known oil paintings, which date to the early 1650s, depict Italianate scenes inspired by the compositions of Dutch painters such as Nicolaes Berchem and Jan Both. Siberechts may have come across their work in his native city, as there is no evidence that he travelled to Italy. In these early works the artist focused on light and its effect on the elements in his compositions. He depicted the light as it bathes extensive landscapes with peasants, flocks and herds but omitted elements typical of scenes of this type, such as mountains, ruins and young Italian peasant girls. 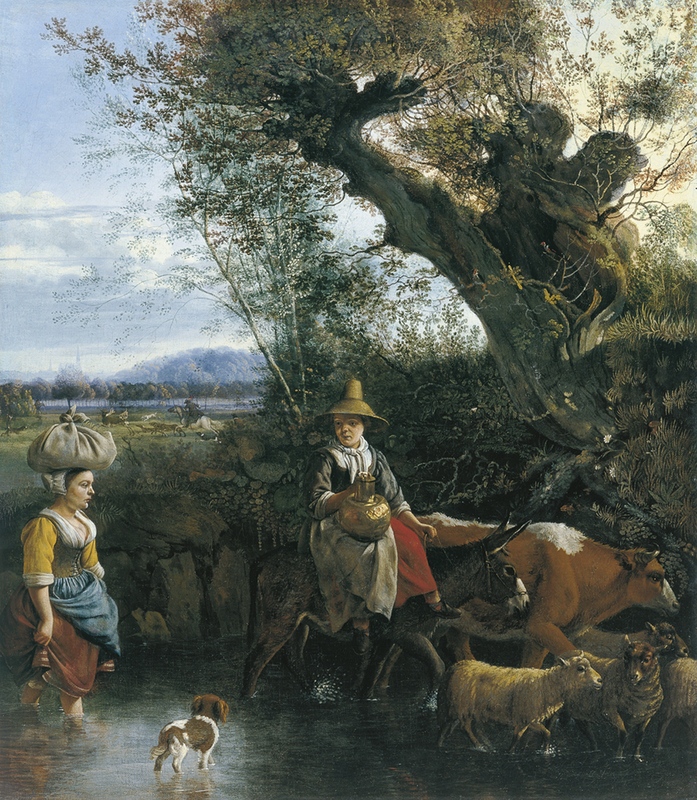 In the 1660s Siberechts’ work changed direction and he focused on the Flemish countryside and country life. Among the innovations that the artist introduced at this point in his career is the new importance conceded to the figures, particularly his strong, robust country girls, dressed in saturated tones of bright red, blue and yellow. These figures stand out as a result of their volumetric modelling and the manner in which they are set against brightly lit areas of countryside. Siberechts’ countrywomen travel in carts, on foot and on the backs of mules and they are seen carrying objects, bundles or baskets, crossing flooded roads or fords. Such motifs offered the artist a pretext to depict the visual effects produced by the location of the figures in the water. 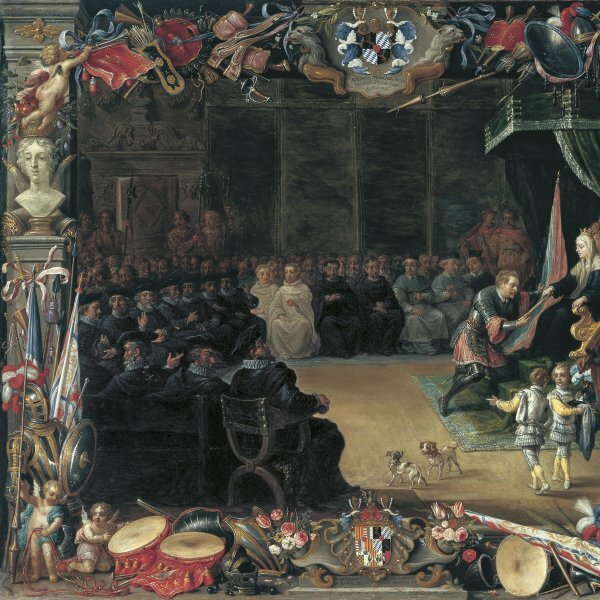 The present canvas has been dated to Siberechts’ Antwerp period of around 1660 to 1672, before the artist moved to England, where he is documented in 1676. The composition is clear and simple with a number of characteristic elements that articulate the space. On this occasion Siberechts included two robust countrywomen, one crossing the stream on foot and the other on a donkey, both following behind a mixed herd of cattle and sheep. The light falls on the figures, strongly modelling their forms, which are emphasized by the colours of the clothes and which stand out against the grey-green of the lush vegetation on the banks of the stream. In the background on the left Siberechts included a secondary scene of hunting that takes place in a meadow. Gaskell referred to two canvases by the artist that repeat elements found in this one, one of which was in the Stackelberg collection while the other is in the Szépművészeti Museum in Budapest. 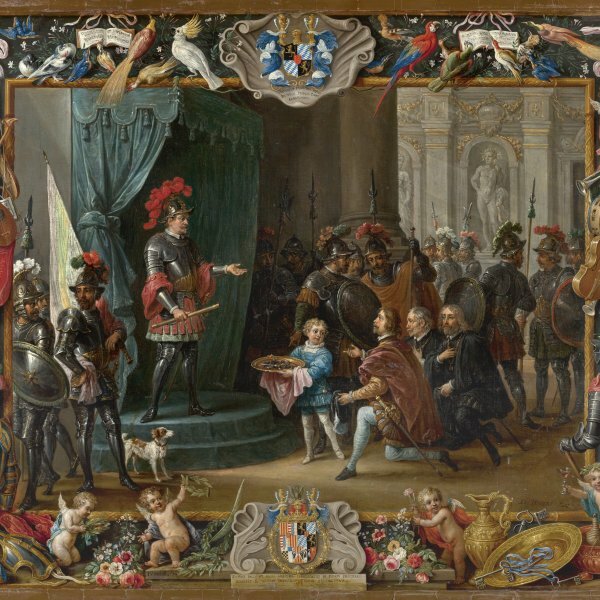 The Budapest painting includes the group on the right of the present canvas, albeit with some small variations. The repetition of this group, which appears in other works by Siberechts, suggests that the artist had a repertoire of sketches that he used as the bases for his compositions, of which only some drawings of trees have survived. The present canvas was described as a signed and dated work of 1653 in the 1937 catalogue of the Collection. In the 1969 catalogue, Ebbinge-Wubben interpreted the date on a stone on the left as 1661. Both that date and the signature are no longer visible.